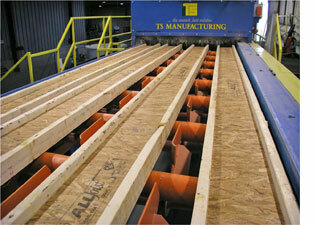 Your BLUWOOD treating system needs to be both efficient and flexible. We have the capability and experience to customize equipment for your facility, with options for future enhancements built-in. 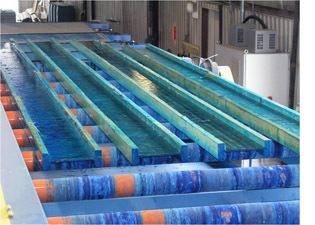 TS Manufacturing understands that you need to produce top quality products while remaining competitive. 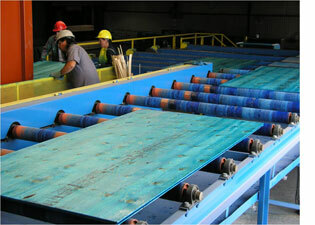 We have designed BLUWOOD lumber handling solutions that range from simple and safe TS Perfect Finish Coaters (with our optional Automated Lift & Lower System) to automated Panel & Board Handling Systems, capable of processing over 25,000 bdft/hr of lumber and paneling, with only 5 handling personnel. TS Manufacturing can design, manufacture and install services with 'turnkey' capability whenever required. Our rugged, dependable equipment includes Package Breakdown Systems, Lumber Separation & Loading Machinery, High Speed Coater Infeeds, Perfect Finish Coaters, Automated Lumber Stackers, Automatic Package Handling & Strapping Systems, and many more products.